Carmelo Anthony re-signed with The New York Knicks for lack of a better option, as The New York Knicks re-signed Carmelo Anthony for lack of a better option. Loyalty was never a factor for either party. If a viable opportunity to win a championship had materialized, Anthony would have left New York, and The Knicks would have been less than crushed to see him go. But defecting to Chicago or L.A. would have improved Melo’s chances of winning a championship marginally or not at all, and accounting for the injuries of Derrick Rose and Kobe Bryant introduces unknowns as daunting as any in New York. The Knicks faced a year of utter irrelevancy in losing Melo, but also a considerably brighter horizon in 2015, when they would have nearly twice as much cap room in free agency and, presumably, a lottery pick in the draft. By inking Carmelo to his new 5-year, $122 million dollar deal, The Knicks have placed their hopes squarely on the shoulders of a superstar nearing the end of his prime who played more minutes than any other player in the league last season. On paper, this is a recipe for disaster. In the masochistic and irrational mind of a Knicks fan, it is the first step on the path to glory. First, the hurdles, which are legion. For effect, minimal punctuation will be used in the following list of The Knicks’ concerns, a bona fide litany in no way limited to having a General Manager with zero front office experience and a head coach with zero sideline experience and the twin malignant tumors of the Stoudemire and Bargnani contracts still on the books and arguably a worse roster than the one last year that failed to make the playoffs in the one of the least competitive conferences in NBA history, a roster that still includes Amare Stoudemire’s bum knees and Andrea Bargnani’s broken soul and Iman Shumpert’s inconsistency and Pablo Prigioni’s defense and J.R. Smith’s shot selection and J.R. Smith’s pranks and J.R. Smith’s committable lunacy and J.R. Smith. Which is to mention none of the unmentionable names that fill out the rest of the roster. All of these are but the iceberg’s tip of the issues The Knicks must address before becoming even a fringe contender in the East, a conference far more competitive than it was just a year ago. And then there is the elephant in the room full of elephants. 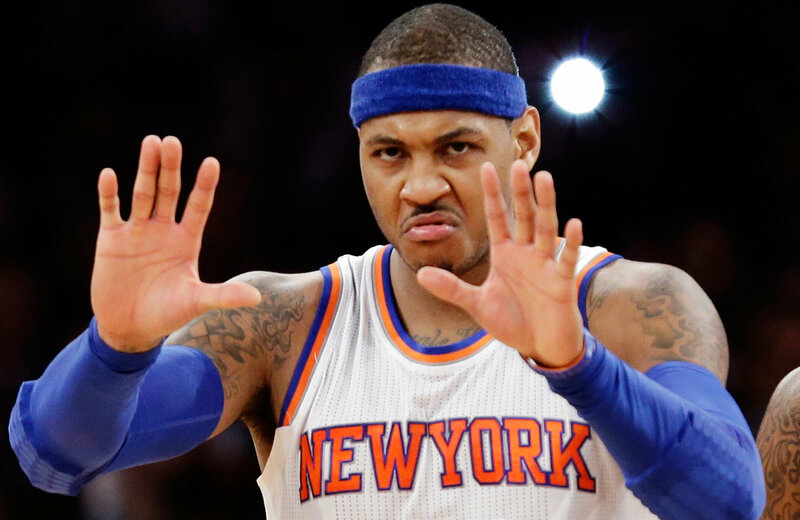 At this point in his career, Carmelo Anthony isn’t going to improve as a basketball player. He is thirty years old, either at the tail end of his prime or the beginning of his decline from superstar to star. The best case scenario over the next five years, for both Carmelo and The Knicks, is that his level of play holds at their current levels of offensive brilliance and defensive mediocrity. This is a possibility, if an outside one. The likelier outcome is one or two years of equal to slightly diminished statistics, followed by a persistent trend of diminishing performance. Carmelo has also wrestled with nagging injuries in the past, and the risk of severe, season-ending injury increases with age. Excluding Carmelo, the top ten most valuable players in the league are approximately LeBron James, Kevin Durant, Blake Griffin, Russell Westbrook, Chris Paul, Kevin Love, Anthony Davis, Stephan Curry, James Harden and Dwight Howard. All of those players are younger than Carmelo Anthony. What The Knicks have to ask themselves is, If Carmelo wasn’t excluded, would he even make the top ten? Top fifteen? 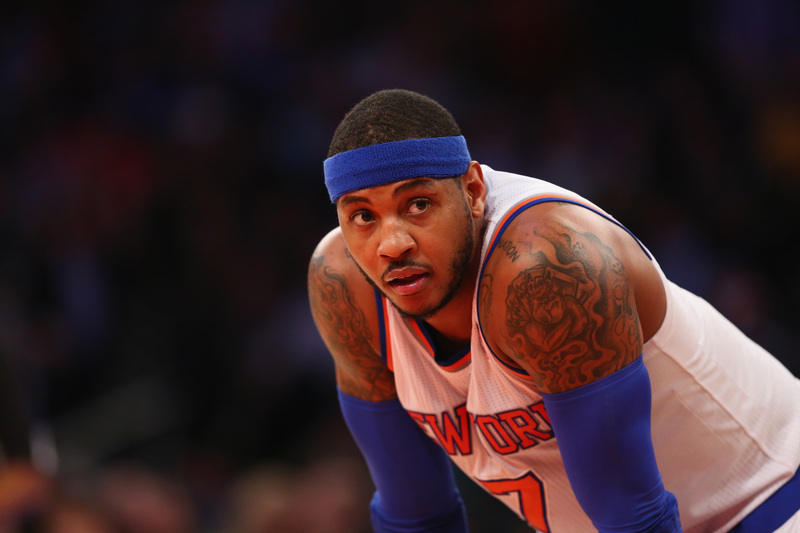 Can a championship contender still be built around Carmelo Anthony? Could it ever be? If this video is any indicator, yes, a championship contender can be built around Carmelo Anthony. The central problem of his career with The Knicks is that circumstance has prevented that building of a contender at the foundational level. Abominable front office decision making has furnished Anthony with hodgepodge rosters of has beens (Rasheed Wallace, Jason Kidd) and never-beens (Kenyon Martin, Andrea Bargnani). Carmelo is partly to blame for this, since The Knicks sent nearly all its assets to Denver in exchange for him. What has befallen the franchise in the ensuing years reads like a comedy of errors. Amare’s knees imploded before fans could truly appreciate how ill-suited his style of play was to Anthony’s. J.R. Smith won Sixth Man of the Year and promptly elbowed Jason Terry in the face for no discernible reason, sending the entire team into a two year tailspin. The Knicks didn’t just sign the worthless Andrea Bargnani, one of the worst 1st overall picks in NBA history, they traded draft picks for him. Then they re-signed Raymond Felton, a fat person who happens to wear a basketball jersey. One needn’t squint to see how some, if not most, of these decisions were made as a result of Carmelo’s original trade. His staying may be an admission of guilt, albeit a silent one. 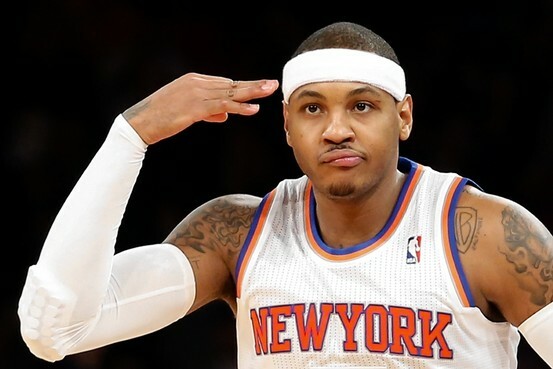 But Carmelo’s decision to return has nothing to do with the upcoming 2014-2015 season. The Knicks will be lucky to make the playoffs in the retooled East this year, and any success thereafter is icing. Carmelo re-signed to make a last push for a Finals appearance in years three and four of his contract, when The Knicks have the financial wiggle room to lure free agents like Kevin Durant and Phil Jackson’s philosophy has ingrained itself in the culture. And while these possibilities also aren’t givens at all, with Durant likelier to sign elsewhere or stay in Oklahoma City, and The Knicks potential ability to run The Triangle limited by a lack of talent, the tide does seem to have turned in the right direction. Felton and the shell of Tyson Chandler have been shipped to Dallas. Amare’s and Bargnani’s contracts expire after this season and are trade assets until then. A statement like “Tim Hardaway Jr. may be the second best player on this team” would sound like a death knell to most NBA fans, but it is a sweet and hopeful lullaby to fans of The Knicks. Things are getting better, if only because they couldn’t get much worse. Stars, planets, moons and meteors have to align perfectly for Carmelo Anthony to lead The Knicks to the NBA Championship sometime over the next five seasons. Theoretically, he would have been a few inches closer in Chicago, where his offensive prowess could have reanimated the Bulls’ dead attack while their extant system compensated for his defense. Why didn’t he put himself in the best position to win? The answer still has nothing to do with loyalty, everything to do with irrationality. Carmelo Anthony returned to The Knicks for the same ludicrous reason the franchise’s battered fans continue to root for The Knicks. It is a pathology rooted in delusions of grandeur and baseless exceptionalism, the claim, not altogether unfounded, that New York City is the best city in the world. This may not be the case for everyone, but it is the case for Carmelo Anthony. Lack of better options abound when you’ve already found your best option. For it may be a far, far better thing to fight and fail in New York than to win anywhere else.